Omni La Mansiόn’s award-winning Las Canarias restaurant offers epicureans a romantic experience, whether it be for breakfast, lunch, or dinner. 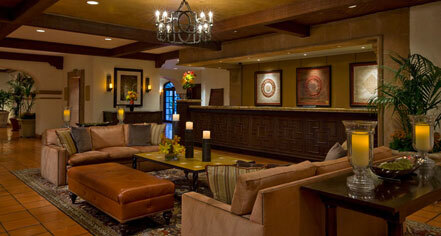 The elegant setting is enhanced by daily menu selections and the freshest ingredients from top-rated farms and ranches. Executive Chef Benjamin Knack incorporates a broad variety of Hill Country game meats to the menu and uses indigenous herbs and spices to reflect New American cuisine with the strong regional flair of the Texas Hill Country. 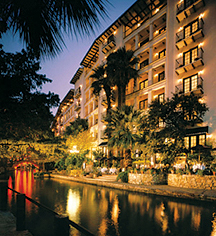 Guests may dine indoors in the multi-tiered dining room, or alfresco and watch river barges float by on the serene Paseo del Rio. El Colegio: Once the library of St. Mary's College, El Colegio offers a large selection of Texas beer, wine, and Tex-Mex appetizers. Morsels: Located just off the lobby, enjoy freshly brewed coffee, espresso, and cappuccino, along with pastries baked by the own pastry chef. An array of beverages, snacks, and sandwiches will bring you back for lunch. And if you’re missing last-minute travel items, you can pick them up here. Open from 6 a.m. – 3 p.m. daily. Guestroom Dining: 24-hour in-room dining is available for your convenience and include selections from the Las Canarias menu. Ostra: Enjoy exquisite cuisine in a romantic riverfront locale at the sister hotel - Mokara Hotel's signature restaurant, recently awarded Wine Spectator's Award of Excellence. The Executive Chef passionately oversees a sustainable seafood menu filled with exotic new dishes and tempting standards. And don't miss the acclaimed Oyster Bar, which includes a variety of the freshest oysters, clams, crab, shrimp, and ceviche. A full wine list and specialty tequilas are also available. For reservations, call 210-396-5817.